In Para 101.26, and 10.1.27, the 7 CPC has dealt with the quantum of minimum pension. The 7 CPC has not adduced any reason as to why the demand of minimum pension as minimum wage is not acceptable. The Commission had asked for the opinion of the Deptt of Pension in the matter. From what is stated in the report, the Dept of Pension evaded answering the question. There had been no rationale in fixing 50% of Minimum wage as Pension. Pensioner also can’t live without need based minimum wage. The only point that could have been probably considered with some rationale was that in the case of pensioner, the family Unit need not necessarily be 3 as in the case of serving employees. In the case of serving employee, the family unit is taken at 3 on the plea that the family consists of husband, wife and 2 children. Probably exclusion of children from the Pensioner family unit might be justified. From that view of the matter, the minimum Pension ought to have been fixed at MWx2/3 = Rs 12,000 (as present). 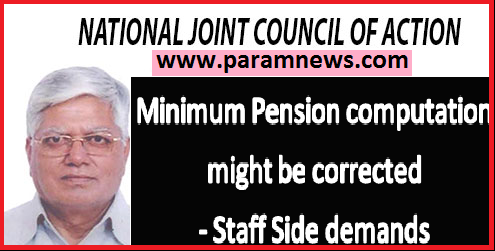 The staff Side demands that the computation in respect of minimum Pension might be corrected and revised orders issued, adopting the sound rationale mentioned above.